After millions of LED tubes have been installed, much information about the products’ origins and quality have come to light (no pun intended). Burn hazard incidents have been reported and custodial staff have been shocked. People started to pay more attention lately when UL made a statement about a manufacturer using a false UL certificate on its LED tube. The end users are confused as to which LED tube to use, and the distributors and/or contractors offer little clarification, perhaps due to lack of knowledge or perhaps care. The manufacturers make contradictory statements about LED tubes, thus resulting in conflicting rebate requirements from the utility companies. The development of the LED tube has a history of trading one type of hazard for the other type. Moreover, the term "generation" is used loosely here to refer the fact each LED tube design led the market for a period of time in succession. Gen 1. Type B Double-end Tube: The first popular model was line-voltage (ballast bypass, a.k.a. 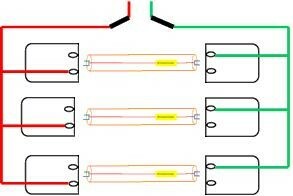 Type B) double-end wired LED tube (referring to the wiring diagram below). It was popular because its retrofit process takes a simple ballast bypass and it can operate with shunted and non-shunted sockets. There is no need to replace sockets, unless there is significant damage to the existing ones. Moreover, it gets rid of the ballast maintenance costs. Everyone, the manufacturers, the distributors, the contractors, and the end users, were happy but the trend didn't last. UL was quick to identify the electric shock hazard with this design (when inserting one end of the tube into a fixture with power on, touching the other end of the tube will cause an electric shock), and subsequently mandated an anti-shock protection requirement in the UL 1598C safety standard that governs LED luminaire retrofit kits, the IFAR category, which the LED tube falls under. Most of the Type B double-end LED tube disappeared from the market. Some manufacturers got their Type B double-end LED tube certified through another safety body, ETL, by exploiting a loophole of the ETL standard on not requiring the anti-shock protection. It is worth noting that these ETL certified tubes can't meet UL anti-shock requirement for there is no anti-shock protection. There are a few of UL-certified Type B double-end tubes on the market, and they each have an anti-shock mechanism for meeting UL safety standard. Gen 2. 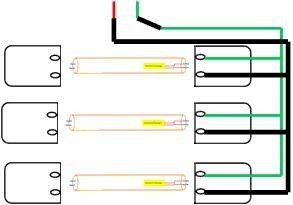 Type B Single-end Tube: The Type B single-end tube (see the wiring diagram below) appeared on the market the same time as the double-end tube. However, it was the less favored of the two because it involved rewiring the hot and the neutral wires to one socket, and more importantly, a shunted socket needed to be replaced with non-shunted socket in order to operate with single-end wiring, which more than doubled the installation time and labor cost. When UL 1598C drove the non-qualified double-end tubes out of the market, most manufacturers moved to Type B single ended tube design for it is shock-free by nature, thus easily meeting UL anti-shock mandate. However, shock free doesn't mean risk free. Remember there is another type of hazard, the burn hazard. When a single-ended LED tube failed in a retrofitted fixture, unsuspecting custodial staff would insert a fluorescent tube into the retrofitted fixture, thus causing it to short out immediately. This was due to the fact the bi pins of the fluorescent tube are connected. There were incidents where the fluorescent tube literally exploded at 277V under such scenario. The warning label affixed on the fixture (advisory against using fluorescent tube on retrofitted fixture) was of little effect if a custodian or maintenance person didn't bother to read it. It is due to this liability (and to avoid legal issues arising from such situations) that none of the top three US lighting manufacturers ever made or sold Type B single-end LED tube. Some utility companies overheard haphazardly, the issue of fluorescent tube shorting out on retrofitted linear fixture, and reacted by disqualifying Type B LED tube (single-end and double-end) from their rebate program. This decision was made without researching the market to understand what makes double ended safer than single-ended technology and what UL provisions were in place for such safety. 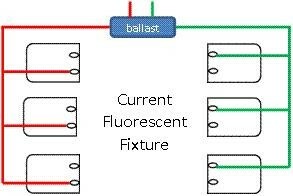 In fact, inserting a fluorescent tube into a double-end wired fixture won't have any consequence, for there is no ballast to complete the circuit (loop). The line voltage even at 277V is not high enough to activate the fluorescent tube, and thus there is no shock hazard either in such scenario (of double-end wired fixture without a ballast), unlike the single-end wired fixture. -Ballast dependency: it can't operate without a ballast. -Ballast-triggered arcing and burn hazard: a fixture with a ballast and a loose socket is a perfect setup for arcing. A reader can assign his or her own decision based on these factors. However, paying the additional aforementioned $18 cost for the Type A tube operation in order to get the $5 rebate per lamp has deluded some users, that is, the rebate looks great when compared to the initial upfront cost of the product itself, but ultimately costs more to operate over the life span of the product. The bottom line is that the ballast was designed for fluorescent tubes to begin with and it wasn't designed for the LED tube. It is amusing that it is now praised by its proponents as a safety device for operating Type A LED tube. With this claim, it is only fair to ask, “is type A safe?” One top US lighting manufacturer had two recalls of its Type A LED tube and another had one recall of the same. As long as a ballast is in the linear fixture, arcing is bound to happen on a loose socket. The severity of the arcing damage depends largely on the actual Type A tube construction. To put it frankly, there is nothing sacred about trading the fluorescent tube explosion hazard (of the Type B single-end tube) with arcing trigger burn hazard (of the Type A tube). The root of the arcing is from the ballast’s own initial 600V, for activating the fluorescent tube. Without a ballast, the line voltage at 277V isn’t high enough to induce arcing. Touting the ballast as a safety device for Type A tube operation is ... a highly creative marketing spiel, effectively prolonging the market life of the ballast and smacking in the face of the technology pundits who declared ballast had no place in an LED era. The verdict on the ballast and hence the Type A LED tube will come when the LED rebate money dries up; that day is numbered. Gen 4. Type D (Dual-mode) Tube: The dual-mode LED tube, which operates with ballast (Type A) or line voltage (Type B), showed up over two years ago, though not out of the safety improvement. Rather, it is an economic play for it releases the end user from ballast dependency. An end user can install dual-mode type into a linear fixture directly if it has a compatible ballast. In the event of an incompatible ballast or should the ballast reach end of life, the dual-mode tube can be rewired to run on line voltage, thus ridding of the ballast energy consumption, maintenance, and arcing once for all. In other words, dual-mode or Type D tube is supposed to be the best of both worlds, Type A and Type B. The demand is strong enough for UL to expand its OOLV category (traditionally for direct replacement lamps, such as screw-in bulbs or Type A LED tube) and begin to certify the dual-mode tube under the designation of "Type A/Type B." And this is where the problem came in. The UL OOLV Type A/Type B will certify dual-mode tube, regardless whether the tube operates single-end or double-end configuration on line voltage. However, most of the UL certified dual-mode tubes that operates in double-end configuration on line voltage have inherent electric shock hazard due to the lack of a proper anti-shock protection. Those UL certified dual-mode tubes in single-end configuration on line voltage inherits the same problem of the Type B single-end tube. The supposedly best of both worlds now is the worst of both worlds. Deja Vu all over again! In contrast, there are a few dual-mode tubes that are already UL certified under both OOLV Type A/Type B and IFAR Type B, i.e., they are double-end wired and free of electric shock. In light of the above development history, it would be misleading to claim that all dual-mode LED tubes are dangerous, all single-end wired fixtures are immune to fluorescent tube shorting, and/or all Type A tubes are free of arcing or compatible with all ballasts. Ask questions until you feel confident about the product and ask to be shown that your manufacturer or supplier is knowledgeable on the strength and the limitation of its product. When a manufacturer or supplier is telling only the half of the story, be on the alert! It can be argued that if all custodians would turn off the power when replacing LED tubes, or there are no fluorescent tube in a building after LED tube retrofit, or there is no loose socket in any of the ballasted fixtures, or nobody cares about the additional operation costs associated with ballast, then using any of the LED tubes makes no difference. If these assumptions are off, then it will be prudent to use a fool-proof, fail-safe LED tube solution. It is expected to have at least one more generation, Gen 5, of LED tube design that would shape the final form of LED tube and live up to the hope of being the best of all worlds. Moreover, with UL clarifies its dual-mode tube requirements on anti-shock protection for line voltage operation, there will be nothing to worry about, right? Wrong, unless you know how to not to be fooled by a fake UL certificate, https://www.linkedin.com/pulse/fooled-fake-ul-certificate-matthew-maa. Welcome to the party!